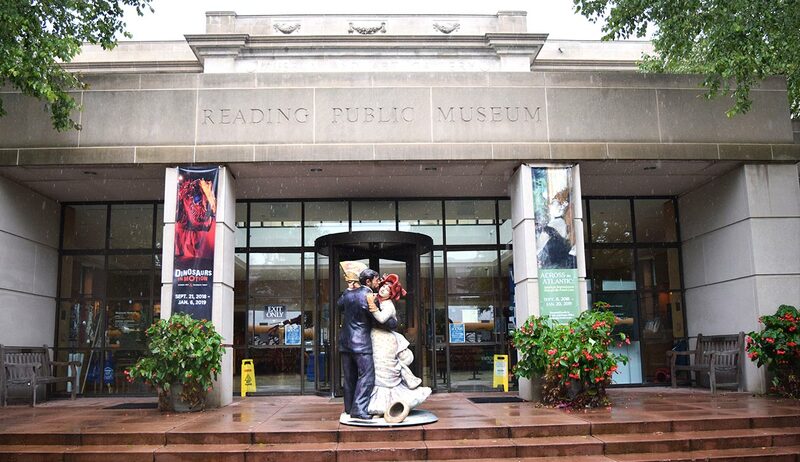 September 28, 2018 — American realist Seward Johnson’s sculpture Time For Fun has been added to the widely lauded exhibition Across the Atlantic: American Impressionism through the French Lens at the Reading Public Museum. 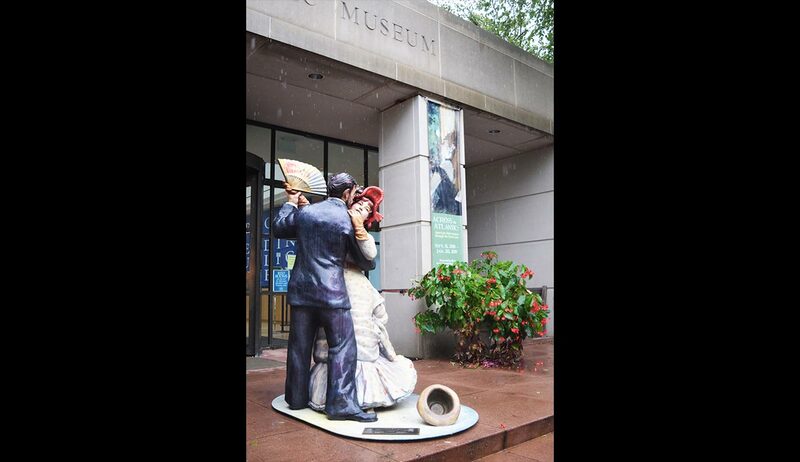 On loan from The Seward Johnson Atelier, the work from the artist’s Beyond the Frame series features life-scale bronze tableaux inspired by Dance in the Country by Impressionist master Pierre Auguste Renoir. The sculptor’s engagingly theatrical installation actually allows museum goers to inhabit a famous work of art that they’ve known and loved throughout their lives. The life-sized, bronze sculpture offers a one-of-a-kind experience to visitors as it is visually stunning, inviting viewers in to explore the minutely crafted details of the sculptured figures, and encouraging the discovery of witty surprise touches not present in the original oil painting. As Johnson says, “The artist only painted part of what he saw. What is beyond the frame is my territory, and I have had a tremendous amount of fun deciding what to include.” This, of course, means that partial figures from the paintings must be “completed” in the third dimension and interactions between the various characters are played out. 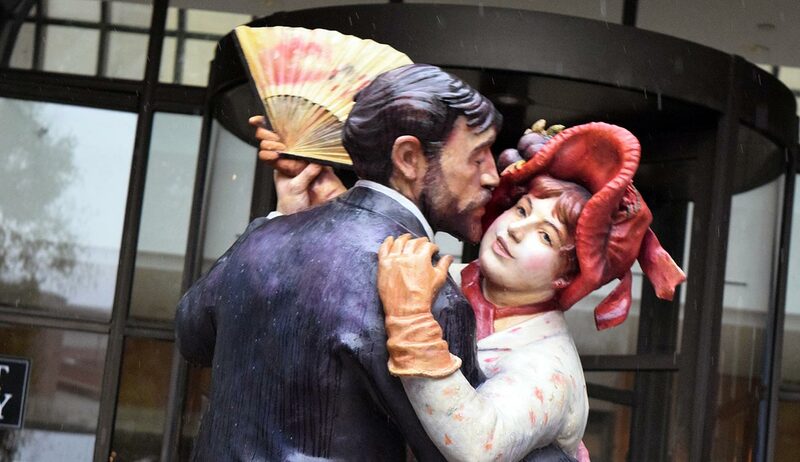 To date Johnson has created three dancing couples inspired by Renoir’s well-known series of couples. Compared to the formal, almost solemn mood of other sculptures in the series, Time for Fun is as open as the fan splayed in the hand of the woman, who listens with abandon to the sweet nothings of her partner in anticipation of a kiss. In Johnson’s three-dimensional interpretation, we are especially aware of her ample, ruffled dress cinched at the waist that emphasizes the curves of her body. Her robust figure contrasts with the slim elegance of the city counterpart, but her plump stature is embraced by her companion. The partners seem, in fact, to complement one another, her rounded shape playing off his lean one, which is accentuated by his dark, tailored suit. Paul Lhote, author and long time friend of the artist, modeled for all three of Renoir’s dance paintings, but this is the only one for which Aline Charigot posed. She became Renoir’s wife. The sculpture will be on view at The Museum through January 20, 2019. The sculpture is located outside, on the main steps of The Museum. Across the Atlantic: American Impressionism through the French Lens is sponsored locally by the Marlin and Ginger Miller Exhibition Endowment.